The Hervey Range area has much history to offer that's not too far off the beaten track. The aboriginal paintings at Turtle Rock & bottom of the range, the old highway up the range (the graveyard & archaeological materials), and the old Greenvale Line (old drain pipes and train tunnels) all forge an interesting place in history. Other than Fred's Peak and Harvey's Marbles, there are also a few other cliffs out this way that would make for some good climbs. Please note that permission/permits may be required to access parts of this area including, but not limited to, the Greenvale Railway Line, The Old Highway, The Range Hotel, and Mount Luke Mine. There is a waterfall that many people don't know exists as it only shows itself after heavy rainfall. Once you leave the flats and begin the ascent of Hervey's Range on Hervey's Range Rd, Bridal Falls will be on your left just a little before the concrete bridge that is about half way up to Pipers Lookout at the top. There is a good size area to pull over just after the falls on your right. After all the rain, Bridal Falls will be flowing well as they are normally just a dry rock face. You will easily see them as they are literally a small stones throw from the road. Construction of the Greenvale Branch Railway started in the 1970s with the main purpose of transporting nickel from a mine at Greenvale to a smelter at Yabulu near Townsville known as 'Palmer Nickel and Cobalt Refinery'. Mining at Greenvale took place between 1974 and 1992 during which nickel laterite ore was transported to the Yabulu refinery by rail and processed up until 1993. In 1993, the mine ran out of ore and the line was closed. Queensland Nickel Industries (QNI), who use to operate the line, entered voluntary administration in 2016. Some of the longest trains in Australia were pulled along this. The railway line tracks were removed in mid-2000; however the bridges, cuttings, blue metal and easement remain. Before the track was lifted, there was an attempt to have the section through the Hervey Range remain intact as a tourist line but that fell through and the rails were removed. There was also some talk about it being turned into a walking track. In August 2015, one of the tunnels collapsed due to a landslide and the tunnels were closed due to safety reasons. Now no entry & falling rock hazard signs are at the entrance of the tunnels and the Hervey Range Quad Bike Tours have stopped operating in the area. It was perfect place to ride your mountain bike in the afternoon to sunset, shaded mountains. The best way to explore the tunnels was on a mountain bike; it was fast and efficient. The Townsville Rockwheelers use to ride these undulation single tracks through the deserted tunnels but no longer due to the closure and safety concerns. The Department of Transport and Main Roads manage closed rail corridors across the state. The Greenvale line is state owned land and the closed rail corridor is not open for public use. Additionally, it is also not safe to be traversed due to large scours and one of the tunnels being partially collapsed. 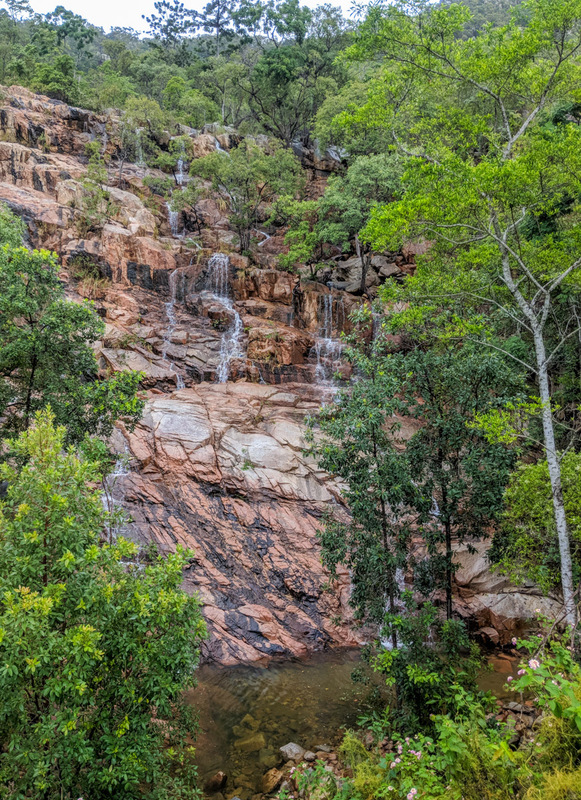 The old Hervey Range Road, now known as Page Road, is one of the few surviving examples of a roadway dating from early European settlement in the region and was the initial route inland from the port of Townsville to the hinterland areas. Back in those early days, it took up to four days for a bullock team and wagon to travel from Townsville to the foot of the Hervey Range. They first crossed the Bohle and Alice Rivers, sleeping at Range Inn before ascending the bullock trail through to Thornton's Gap. Currently the journey from Townsville to Hervey Range takes around 20-30 minutes on the new highway. If you go down the old road, have a look at some of the old stone pipes that go under it. There are now 1000 KVA powerlines that run down the range and part of the old highway is maintained by Ergon. Access to Mt Spec area in Paluma was originally via Thornton's Gap. Arthur Benham first used teamster William James to transport his bagged tin to Townsville down through Running River and over the range at The Pinnacles. This road was very steep, and required a large log tied to the back of the wagon as a brake. Bringing in the five-head battery for the Mt Spec Tin Mines took six weeks over Harvey's Range via Waverley Tin Mines. Since traveling up the range took several days, accommodation was needed by the travelers. At the bottom of the range was Range Inn and at the top was Eureka Hotel. Eureka Hotel is a heritage-listed and was built at the summit of Thorntons Gap in 1865 and is now known as the Herveys Range Heritage Tea Rooms. Range Hotel is a heritage-listed archaeological site at old Hervey Range Road (now known as Page Road). The hotel was built in 1865 to 1866. Range Hotel closed in 1884 and its precise location is now a matter of speculation, although a bottle dump, thought to have been associated with the hotel has been located. Archaeological surveys of the section of the old Hervey Range Road have the potential to reveal important information about early road construction techniques. This was one of 6 camps that existed on the length of the Greenvale line. The Range Hotel has the oldest head stone in Townsville region dating back to 1866. It's a testament to how hard to early pioneer life was. The graveyard is located near the bottom of the range about 150 metres south of the old pub and toll gate. The burial ground provided a resting place for travelers and livestock using the road between 1864 and the 1970s. The gravesite is overgrown with lantana, guinea grass and spear grass. "The Range Hotel burial ground contains sandstone headstones that are highly characteristic of nineteenth century cemeteries in this region, with relatively ornate decoration typically found on graves dating from before c.1880. There is potential that the recorded burial ground contains additional graves (possibly as many as 21) which also date to the earliest European settlement of the Townsville region. The grave of Francis John Earl, a squatter who died of a fever, aged 25 on 12th March 1866 at the Range Hotel, is the oldest extant headstone in the region. The earliest headstone at Townsville's West End Cemetery dates to 1868, although burials occurred there before that date. Native and introduced vegetation dominates the area, with Moreton Bay ash (Corymbia tesselaris), Poplar gum (Eucalyptus alba), Blue gum (Eucalyptus tereticornis) and narrow leaved ironbark (Eucalyptus crebra) being the most common species. There is a thick cover of grasses in the woodland understorey, comprising Black spear grass (Heteropogon sp.) and kangaroo grass (Themeda spp.). Cocky apple (Planchonia careya) and native Gardenia (Kailarsenia ochreata) are common woodland species in the area. Introduced species include Lantana sp., mango trees (Mangifera sp.) and Agave sp. The Mount Luke Mine is an abandoned lead, silver, tungsten and zinc mine just off Black River. The Mount Luke Mine is at an altitude of approximately 189m.